Rocket League let's plays, reviews, YouTube channel statistics and more. Rocket League is getting another free update in September with GRAPPLE HOOKS! Saw that, looks like great fun! I still play every now and again. Love how the free updates keep coming. Said I was going to buy Rocket League and I did. Except instead of buying it during the “sale” that was simultaneous to the free weekend on Xbox (I didn’t realize the sale ended when the free weekend ended, ‘cause I’m not too bright), I got it for even less from the Steam Summer Sale. Played through the tutorials again (felt like going to practice, not a bad thing, back in the day when I was a soccer player) and went through a season (against bots). Lost in the first round of the playoffs! To rookie bots! In my defense, it was my own rookie bot teammates who scored most of the other teams’ goals for them… but that’s on me. Should never have let the ball leave their half of the pitch in the first place. That’s from just TWO DAYS OF PLAY- and I didn’t even look at the list and purposefully got for any of them! I mean, I will NOW, but sheesh. Just the ego boost I needed after a whole buncha Hearthstone losses. (smirk). 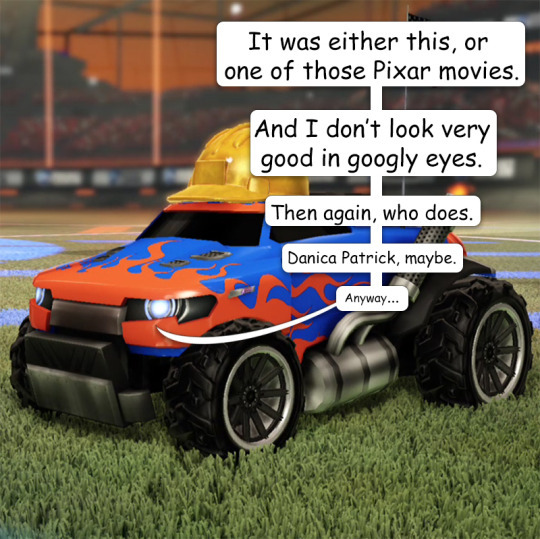 This weekend Rocket League is free to play for anyone with an Xbox One, Playstation 4, PC, or lots of cardboard, scissors, markers, and imagination and patience (okay, that last group can always play pretty much anything for free). I’ve given the game a whirl, finally, and yep: now I’m going to pay money for it. That’s the point of these free weekends, isn’t it? To get us hooked. Well, it worked. Damn it. This game is really fun. I held back for the longest time because I knew I’d be terrible at it. And I am! But I can play with bots, and they’re worse than me. (I mean, worse than I am. Stupid grammar). What an age we live in. The internet and streaming and all that. They can let us try before we buy, and whatever they lose in server space from the glut of freeloaders, they more than make up for in advertising. Cause you know I’m not the only old man raving about how much fun I’m having. Not only am I driving a car around, trying and almost often managing to hit a soccer ball, I’m collecting stuff too. I’ve got a bad collecting-stuff addiction. (I somehow never played Pokemon which is why I am still a functioning adult and not a blob in a basement). I’m collecting tires and toppers and arial flags. I’m playing these tight little 5-minute games, shouting at the screen every time I score a goal, and making my wife nervous with my new manly strut and confidence. So hell yeah, on Monday when the free weekend is over, I’m throwing money at these guys. I’m all in. Who knows, I *might* even play against real people one of these days. I’m thinkin, I’m not the only broken-thumbed gaming wannabe stinking up the pitch. I might even be able to hold my own against some of these poor bastards. You see what I mean about confidence? According to urban legends, giving away free samples is how they got kids hooked on drugs in the 70s. But these digital drugs are waaaaay better. Amiright? Rocket League: Ball + Car = Stupidly Addictive Fun! (Day 57) Playing some Rocket League! Lets get this game started in here! #twitchtv #Rocketleague #fun #streaming! Lost man finds his cheetos. Maybe he wont starve? here is my second montage, pretty fast after my first. I hope you enjoy the video. The editing and goals were all made by me. If you enjoy and you're not subscribed yet please do so, it helps us out a lot. Also give the video a like and be free to comment anything you want, as long as it has to do with our channel or this video. 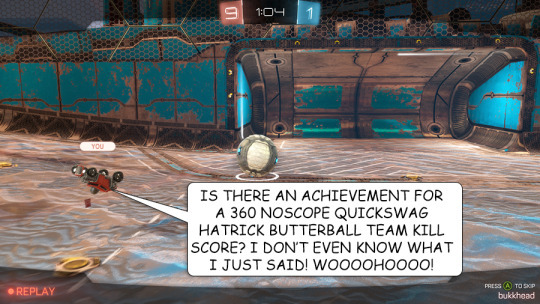 Just got Rocket League today and already had an awesome match! Keep watching to the end, the end is the best part!